Before beginning our review of La Siesta, an excellent but pretty much unknown restaurant in the center of Winthrop, it should be noted that yes, there actually is a center of Winthrop. This may come as a surprise to many folks (including this writer, until maybe a decade ago), as Winthrop is one of the only towns in the greater Boston area to have its downtown area on a side street (or more correctly, a series of side streets). 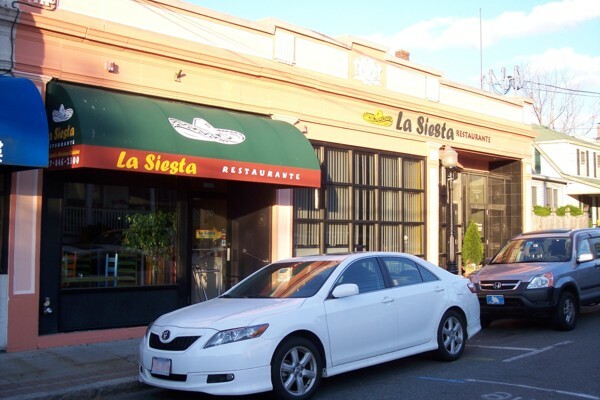 Having said that, it should also be noted that on one of these side streets sits one of the greater Boston's best Mexican dining spots in La Siesta Restaurante. Having started out as a tiny one-room restaurant, La Siesta is now much bigger, with comfortable dining rooms and space for about 100 people, as well as a bar. The atmosphere can be a bit dark and moody (depending on the room), making this a spot that feels just a touch exotic and romantic. One of the best parts of dining at La Siesta is its friendly staff, with servers who are more than willing to help answer questions and an owner who goes from table to table, chatting with diners and making sure that everything is all right. Appetizers and other starters at La Siesta include a wonderful tortilla soup that contains zucchini, squash, carrots, tortilla chips, cilantro, and spices, all in a buttery broth, and a guacamole dip that, while not outstanding, is much better than the sometimes harsh stuff that you get at one of the Mexican chains. And even if you decide against apps, you might find yourself filling up on the chips and salsa that they give you at the start of the meal; the tortilla chips are crisp and nicely salted, and the deep red salsa has a zesty and hearty flavor. Entrees include many dishes that will be familiar to most diners (burritos, quesadillas, chimichangas, enchiladas, tacos, etc. ), but there are also a few less common items on the menu, such as the tilapia veracruz (tilapia and vegetables with white wine, lemon, and spices) and the callitos tampiquenos (scallops sauteed with onions, mushrooms, tomatoes, and peppers in a chipotle cream sauce). La Siesta also features one of this writer's favorite dishes--a chile colorado burrito (a burrito stuffed with marinated pork in a traditional mild red sauce)--and it is indeed a good version of this dish, with the red sauce being deep enough to add some serious flavor to the pork and the rolled flour tortilla. The excellent carnitas plate features fried pork sauteed with a rich orange glaze and a slightly hot pico de gallo. Almost as good as these two pork dishes is the ground beef chimichanga, which is deep-fried and overstuffed with meat. Another standout at La Siesta is the enchiladas mole poblano, which includes a sweet mole sauce that is heavy on the cinnamon and the quality of the chicken is about as good as you will find for this type of dish. La Siesta also has nightly specials such as blackened pork and vegetable skewers and tortellini with shrimp, chicken, and chipotle cream sauce that might make you forget about the more familiar Mexican dishes. People might not think of Winthrop as a place to go for good Mexican cuisine, but La Siesta should help change this; the food is excellent, the service is top notch, and the atmosphere is perfect for both couples and families. If you happen to know where the center of Winthrop is, simply drive down Woodside Avenue until you see the sign for La Siesta; if you don't, either set your GPS in advance, get a good map, or ask for directions at a gas station and you'll soon be at this special Mexican dining spot. Copyright © 2008-2015, Boston's Hidden Restaurants (www.hiddenboston.com).